HAPPY NEW YEAR FROM THE LION'S DEN, Volume 02, Issue 01. A New Year, new possibilities. We are eager to see what God has in store for young men, our school and our community. As we kick off our second semester, we are incredibly thankful for the generosity our donors displayed during the final month of 2015. We were blessed to receive a $20,000 matching goal from an anonymous donor. What is incredibly humbling is that so many people responded to that challenge that we actually exceeded the $20,000 fundraising goal. 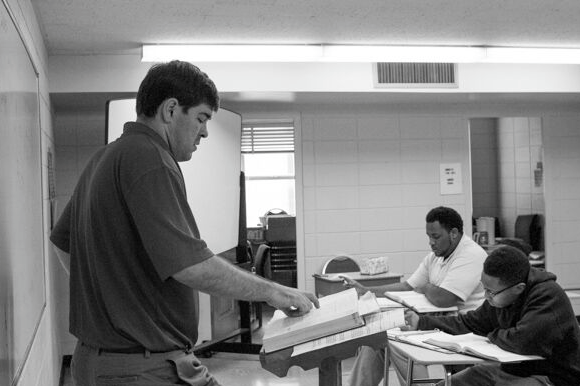 We pray that God continues to work in people’s hearts to help keep Delta Streets Academy alive and well. In early February, our 10th and 11th grade students will take the ACT exam for the first time. To help them prepare, we have been hosting Saturday study sessions. I have been so impressed by our young men and their willingness to sacrifice three hours each weekend to come to school and practice for the exam. More importantly, the young men have been encouraged by the results they are seeing. While their initial diagnostic scores have not been as high as many of them would like, the students often see an improvement after receiving tutoring from our teachers during the study session. This upcoming examination will not be the only time the young men take the ACT, but it is important for both them and for us to have an objective measurement of how they are performing. We earnestly pray that these students are able to see the fruits of their labors on test day. As we look forward to warmer weather in the coming months, we hope that God continues to bless our little school and the students who walk its halls. Mr. Green currently teaches 7th and 8th grade students. He uses a survey approach to his course, hoping to expose his students to as much of the Word as possible. Right now, his 8th grade students are studying the book of Acts and his 7th grade students are working through Genesis. His reading of his students is supported by his interaction with their parents. “When we have parent-teacher conferences, the parents talk about the boys coming home and talking about Bible class and the Scripture in the home,” notes Mr. Green. “I am glad to be a part of these young men’s lives and to have the opportunity to teach them things they might otherwise not have the opportunity to learn from a scriptural and spiritual point of view,” he concludes. Eleventh grade student Andre Williams is the January Scholar of the month. Andre has been coming to Delta Streets Academy since the middle of his freshman year and looks forward to graduating next year. Andre has since rejoined the basketball team and is looking to stay on top of his game both on and off the court. “He’s an example of one of our older guys not giving up and proving that you can improve if you work hard,” says Mrs. Hinckley. While Andre is not sure what he wants to be when he grows up, he knows that he wants to attend Ole Miss for college. To reach that goal, he has regularly attended Delta Streets’ ACT tutoring on Saturday mornings. We hope that all our young men can look to Andre to see that hard work and dedication do pay off. The district tournament for our basketball team is coming up in early February. The team has been looking much better of late as we have been hitting our peak. On offense, if we can get into a half-court set, we have a good chance of getting the ball in the hoop. Given the structure of the district tournament, if we win our first game, we think we have a realistic chance of making it to the state tournament in Jackson. To reach that goal, we’ll need big performances from Dereé Robinson, our point guard, and Kwatravius “Dollar Bill” Johnson, our center. The team will also need strong showings from our shooting guards, Andre Williams and Braxton Lewis. Our Track and Field pre-season is also underway. We started with eight runners and now that the junior varsity and varsity basketball seasons are wrapping up, our numbers are expected to swell. The team returns Justin Cooper, who qualified for state in the 1600 last year, and Jaylin Smith, who is our 11th grade 800 runner. Mr. Hinckley is coaching the sprinters, Mr. Whitten is coaching the distance runners, and Mr. Pullen is coaching the field athletes. The Track and Field team has a lot of coverage across different events, and while we may not win a lot of individual events, the coaching staff thinks we have a good chance to have a strong team showing at the state meet in May.